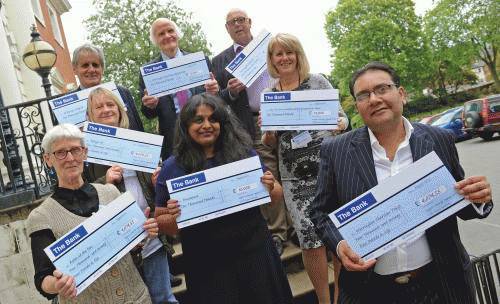 Warrington South MP Mr Rashid officially distributed the funds to his selected mayoral charities at the Town Hall last Monday. Warrington Disability Partnership, the Peace Centre, Brainwave and St Rocco's Hospice received £10,000 each, while Warrington Foodbank, Room at the Inn, Refuge UK and Warrington Charities Trust received just over £4,000 each. Mr Rashid's record-breaking fundraising haul was achieved through a range of events held throughout his term in office, including a charity ball, multi-cultural evening, Warrington's Got Talent competition, bucket collections and bag packs. WDP Chairman John Gartside OBE DL was joined by managers and staff at the presentation event held at the Town Hall. Dave Thompson MBE DL expressed his thanks to Mr Rashid and his support team at Warrington Borough Council.